After a long illness, Margaret passed away peacefully at the Mercy Hospital. She is survived by her loving husband Noel, and her sons Kevin, Stephen, Peter, Paul and their families. She was always surrounded by her family and great friends, as she was in her final moments. Thank you to the many family and friends who have visited Marg and all the medical staff for their recent care, it is very much appreciated by her family. 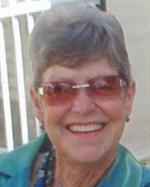 At Margaret’s request, a private service for immediate family will be held. Our sympathy, love and hugs from Bendigo to Noel and family, fond memories of dear Marg she will be so sadly missed.